Salmon caught on Berkley Gulp 8cm minnow in the Twizel Canals. For anglers unfamiliar with soft-baits they are lures that are made from a soft plastic material that yields to the touch almost like a firm jelly. Although we are using the term soft “bait” it looks like a small fish and is actively fished like you would a hard-bodied fishing lure. Berkley Gulp (scented) 8cm Minnows are ideal for trout and salmon fishing. There is an enormous number of shapes and sizes of soft-baits available made to look like all manner of insects, grubs, worms, shrimps, maggots, fishes, and so on. There are also two different types; scented and non-scented. Soft-baits have been popular for sea fishing in the North Island for years but have been much slower to catch on in the South Island where there is a higher percentage of freshwater anglers. Soft-baits also work very well for sea-run trout fishing at river-mouths. The scented type soft-baits were previously regarded by Fish & Game as bait and not lures – another reason they were slower to catch on. As such the scented lures were not permitted on waters where only fly or spin fishing was allowed. However this has changed more recently and the scented types are now permitted in waters where bait is prohibited, and spinning is allowed, provided they are fished as lures and not used or fished as bait! The disadvantage of the scented soft-baits is that they must be kept wet with special attractant oil also sold by Berkley. They actually re-absorb the scent so work better if kept coated with attractant. Berkley Gulp soft-baits showing how to rig for increased swimming action in still water. If you don’t keep them coated with this stuff they dry out and shrink, then all you can do with them is through them away. The problem is that having to keep fishing lures coated with oil can be a messy business unless you invest in a water-tight plastic box to carry them in. Anyone who has fished soft-baits for a while will know what it is like to have a soft-bait container leak attractant oil all through your tackle box! Soft-bait often takes fish when other lures aren’t producing. Just about every species of fish have been taken on soft-bait. They are relatively inexpensive and many anglers now lure fish with no other type of lure. Berkley Gulp! Live! Minnows are one of the most popular soft-baits sold is New Zealand. 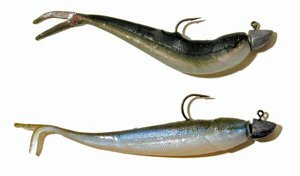 They are ideally suited to trout and salmon fishing as they closely resemble smelt in the 3 inch (8cm) size. Berkley soft-baits are probably the brand most widely available in stores throughout the country. 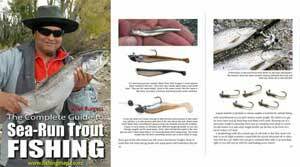 If trout fishing it is best to carry a range of jig-heads in several different weights. 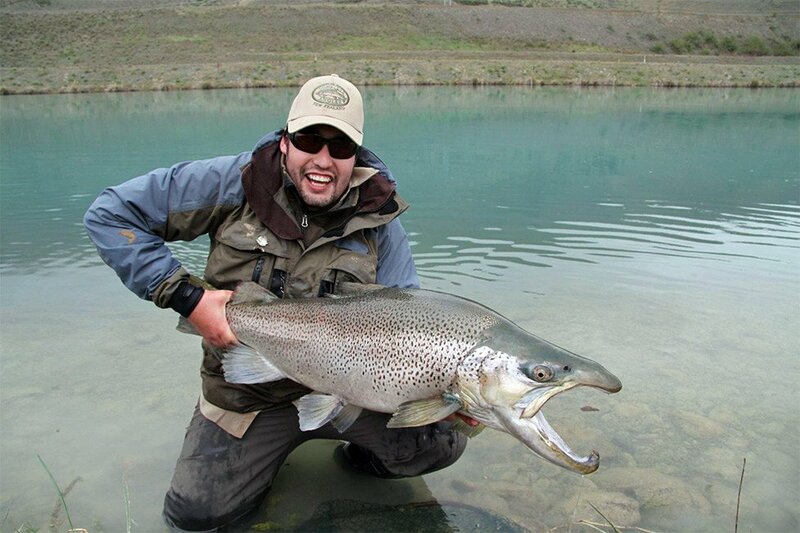 For most trout fishing, weights of 1/6, 1/12 and 1/16 of an ounce are all that is needed. If fishing for sea-run trout in the fast water at a river-mouth you may want to go a little heavier. Soft-baits should be fished on braided line. This has practically no stretch so you can feel every bite and touch on the line. Braid also sinks much faster than monofilament which is the main reason you don’t need heavier jig-heads to take the soft-plastic minnow down to fishing depth. A 1/6 ounce jig-head/soft-bait combination will cast a good distance on a light spinning rod loaded with fine diameter braid. Fish lighter coloured Berkley minnows during the day and in clear water. Try using darker coloured lures in fading light. See the Berkley Gulp minnows at The Complete Angler tackle store in Christchurch.